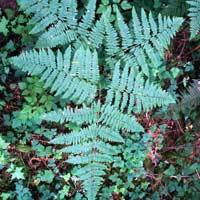 This large fern has triangular shaped blades held horizontal on a single stalk. Because it often colonizes disturbed sites and spreads aggressively, it is often thought of as weedy. It can be quite attractive spreading throughout a woodland.